Tim and Susan Frautschi have shared a life-long passion for surrounding themselves with culture. As avid contemporary art collectors and seasoned travelers, they have generously contributed substantial amounts of time, talent and financial support to the Milwaukee arts community. Their thoughtful leadership on many nonprofit boards has helped make Milwaukee a more vibrant place in which to live and work. 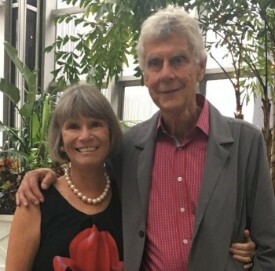 In recognition of their steadfast support, Tim and Sue were together awarded the Milwaukee Arts Board’s “Friends of the Arts Award” in 2013 and UPAF’s Olive Stiemke Annual Award for service to the arts. Tim is a retired partner with Foley & Lardner, where he was a member of the firm's Tax & Individual Planning Department. He has been a director of the State Bar of Wisconsin's Taxation Section, and served as chairman of the Milwaukee Tax Club. Tim is a past president of the Milwaukee Junior Bar Association, a former director of the Milwaukee Bar Association, and a former member of the Governor's Commission on Court Reorganization. A graduate of Madison West High School, he pursued the study of law at the University of Wisconsin Law School at UW-Madison. Tim was elected to membership in Phi Beta Kappa and the Order of the Coif, and was a member of the Board of Editors of the Wisconsin Law Review. Among his many leadership roles, he has served as board president of Present Music, Skylight Music Theater, Danceworks, and Next Act Theatre; and as a board member of the United Performing Arts Fund, Milwaukee Repertory Theater and American Players Theater. He is currently a board member of the Milwaukee Youth Symphony Orchestra, Frank Lloyd Wright Wisconsin and the Contemporary Art Society of the Milwaukee Art Museum. Sue has served the Milwaukee community for many years as a volunteer leader. She has been involved in numerous nonprofit organizations including serving as board president of the Milwaukee Art Museum’s Contemporary Arts Society, Renaissance Theaterworks, and Skylight Music Theater; and as a board member of the United Performing Arts Fund, and the Woman’s Club of Wisconsin. At UPAF, she was one of the founders of the innovative Notable Woman affinity group, a program designed to help fulfill the critical need for arts education to support our next generation in reaching their full potential. Sue was also Campaign Co-Chair of the 2001 UPAF Fund Campaign. Sue is currently a board member of the Friends of Lakeshore State Park and Renaissance Theaterworks. She is also a trained Docent for the Milwaukee Art Museum, where she has long been involved in various capacities. A graduate of Divine Savior Holy Angels High School, Sue attended the University of Wisconsin – Oshkosh and Utah State University where she earned her undergraduate degree. She subsequently completed a Master’s Degree in Liberal Arts from UWM.